This ticket provides admission to a movie. The definition of admission is the permission to enter something or somewhere. 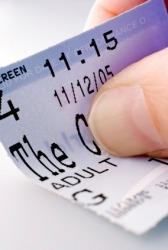 A ticket for a movie is an example of admission. "admission." YourDictionary, n.d. Web. 24 April 2019. <https://www.yourdictionary.com/ADMISSION>. an acknowledging of, or confessing to, some crime, fault, etc. Middle English from Latin admissiō admissiōn- from admissus past participle of admittere to admit ; see admit . The granting of an argument or position not fully proved; the act of acknowledging something asserted; acknowledgment; concession. (UK, ecclesiastical law) Declaration of the bishop that he approves of the presentee as a fit person to serve the cure of the church to which he is presented. The cost or fee associated with attendance or entry. There is no way he has seen that show, the admission is more than he makes in a week. Any act, assertion, or statement made by a party to an action that is offered as evidence against that party by the opponent. A defendant’s failure to deny, or his voluntary acknowledgment of the truth, of an allegation in a complaint, counterclaim, or request for admissions. The acceptance by a judge of evidence for consideration by himself or the jury when determining the merits of the action. The granting or obtaining of a license from a state or an established licensing authority, such as a state bar association, or permission from a court, to practice law in that state or before that court. See also admission pro hoc vice. Then they took their seats in the order of their admission, the men on the right and the women on the left. A 10% surtax on the fees of admission to places of public amusement. The strictness of the principle of admission or exclusion differs at the various German courts, and has tended to be modified by the growth of a new aristocracy of wealth; but a single instance known to the present writer may serve to illustrate the fundamental divergence of German (a fortiori Austrian) ideas from English in this matter. An opportunity occurred when he was seventeen, and by the intervention of friends he obtained admission into the Zaikonospasski school. On the admission of Indiana as a state, Congress gave to it four sections of public land as a site on which to establish a state capital.